Lewis Hamilton reigned supreme in the 2018 Formula 1 season, taking his fifth World Championship. As we’ve reached the end of the season, it’s time to take a look back at what has made 2018 unforgettable both on and off-track! Since Liberty Media took over the running of F1, their goal has been to bring the sport closer to the fans than ever before. One way in which they’ve done that this year is by improving the trackside experience for fans. This season, races have felt like more coherent events. Fans were fully immersed in the F1 experience, with F1-branded and driver flags lining the access routes around the circuits and a larger range of merchandise available to buy, particularly at European races with a dedicated F1 store. Within the paddock, more of an effort was made to pay homage to the country where the event was being held. This was perhaps most evident in Mexico, where there was ‘Day of the Dead’ face painting, a barbershop celebrating the event’s ties with ‘Movember’ and even a Mariachi band performing the F1 theme tune. 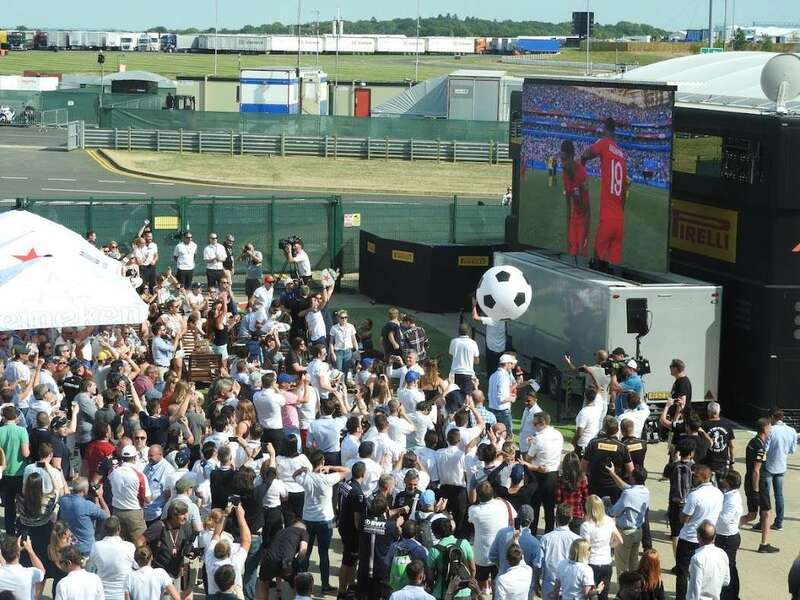 Meanwhile, the British Grand Prix, which coincided with England’s quarter-final World Cup game against Sweden, had a festival feel about it, with the match being broadcast on the TV screens around the track after qualifying. Have you attended a Grand Prix this season and noticed a better experience than in previous years? Let us know in the comments! Away from the track, Liberty’s new approach to reaching fans has seen a welcome step forward this year. An overhaul of the TV graphic and F1’s presentation, including a new theme tune, was met with some scepticism at the start of the year, but by the end of 2018, we’ve grown to love the graphics and there are probably very few F1 fans who haven’t ended up with the theme tune ingrained in their mind. Speaking to Autosport at the end of the 2017 season, Ross Brawn pointed out Formula 1’s need to change with the times. F1’s presence has grown in 2018 across all the major social platforms. From regular qualifying and race highlights packages and other features on YouTube, to a far more informative and entertaining feed on Twitter, the online presence of the sport is stronger than ever and is capable of entertaining die-hard fans as well as the casual onlooker. Other highlights from F1’s output this season have included ‘#F1Live’, a new post-race discussion forum on Twitter hosted by Will Buxton, and the ‘Beyond the Grid’ podcast, in which Tom Clarkson candidly chats with the great and good of the sport, providing new insights on F1’s major stars. While there’s still plenty to be accomplished by Liberty Media over the next few years, most pressingly navigating the 2021 regulations, the new approach is at least going in the right direction from a fan’s perspective. On track, the action has been engrossing. While Lewis Hamilton stormed to a fifth championship victory in the second half of the season, the opening half of 2018 was so close between him and Sebastian Vettel that in the eight rounds between Azerbaijan and Germany, the lead of the championship changed hands five times. One of the main areas where the show has stepped up a gear this season is on Saturdays. Aside from the farcical Q2 session in Russia where drivers didn’t set times for strategic reasons, the qualifying show has been much better, and less predictable. Gone are the days where it was an inevitability that Mercedes would take pole at the end of the qualifying hour. While Mercedes still took the majority of pole positions this year (13), Ferrari were able to challenge much more often, and the gap by which pole was taken was less than a tenth of a second at eight races. Red Bull even managed to sneak in two poles in Monaco and Mexico – their highest tally since the hybrid era began. While the qualifying format is expected to be updated to include a further knockout session in 2019, we hope the battle for the front spot on the grid will be just as tight! While the gap between the top three teams and the midfield teams has been far from ideal in recent years, the battle to be the fourth-best team has been a hard-fought contest throughout 2018, leading to plenty of enticing on-track action. Ultimately, Renault came out on top in the battle by 29 points, though they weren’t the ‘best of the rest’ every weekend. Almost every other team took a turn at being best of the midfield at least once in this year’s races. Haas leapt forward in 2018, Toro Rosso showed their speed in Bahrain, Force India continued to punch above their weight and it was great to see Sauber competitive once again, amassing more points in 2018 than they have in the past four seasons combined. The midfield tussle is likely to be just as close in 2019, and it would be even better if the gap to the top three teams could begin to be closed! The speculation on who would be driving where in 2019 was rife throughout the year, and with the final grid only completed last week, the ‘silly season’ has provided an intriguing, and at times unexpected, backdrop to this year’s racing. Perhaps the most major surprise was Daniel Ricciardo, who shocked everyone just days into the summer break by announcing he’d be joining Renault for 2019. Elsewhere, Charles Leclerc was announced as a Ferrari driver, swapping places with Kimi Raikkonen, and Fernando Alonso announced his retirement from the sport. This, paired with more driver switches, returns and F2 graduates means that only Mercedes and Haas will retain their 2018 driver line-ups for the coming year. The end result of this year’s silly season only serves to make us more excited for next year. Roll on 2019! What have been your highlights of the 2018 F1 season? Are you already planning your trip to a 2019 Grand Prix? Leave a comment below! The Youtube channel, especially Will’s pre/post-race sessions, are the new stuff that have leveled up our experiences. Fernando’s retirement in a non-competitive car is the least part to experience. But in overall Nicky has summarized pretty well all the off-track highlights of 2018 season.